We offer a complete range of different equipments to meet the processing requirements of the milk processing plants. The Equipments like Milk Receiption Complete, Milk Processing Including HTST Milk Pasteurizer, Cream Pasteurizer, Milk and Cream Storage system, By Product plant like Butter Processing, Ghee Processing, Curd Plant, Set and sturd Yoghurt Plant, Skim Milk Powder Plant, Whole Milk Powder Plant, Dairy Whitener plant, Casein Processing Plant, Whey Processing Plant will be supplied either in Manual operation mode, Semi auto mode and fully auto mode. We manufacture the DX Bulk Milk Cooling system to enable the smooth milk collection. Our range of Bulk milk cooler will be from 500 to 10,000 LPD of Handling. 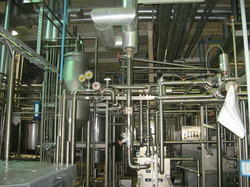 Looking for Milk Processing Plants ?